Located 5 miles south of Monmouth, OR, near Highway 99 (15 miles north of Corvallis) is Helmick State Park. Established in 1922 from a donation by “Grandma Helmick,” this was originally part of a homestead claim made in 1846. This plot of land was the first deeded to the State of Oregon for park purposes. Originally only five acres, Helmick Park has been enlarged to over 30 acres. 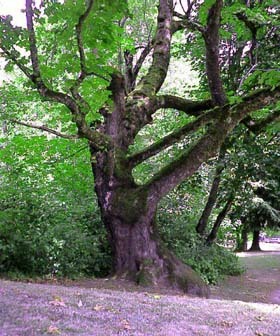 There are many large oaks which provide shelter for the picnic tables beneath them. The view of the river which borders the north edge of the park was unimpressive. The park is equipped with toilet facilities, picnic areas and lots of room to run. The ease of access from the main road makes this an ideal site for a quick picnic.